RALEIGH, N.C. — A federal appeals court has reversed its previous decision banning officials in North Carolina from issuing “Choose Life” license plates after the U.S. Supreme Court asked the court to revisit its ruling in light of a similar decision from the nation’s high court. As previously reported, in February 2014, a three-judge panel with the 4th U.S. Circuit Court of Appeals unanimously upheld a federal judge’s ruling that struck down the plates as being “at odds with the First Amendment.” U.S. District Court Judge James Carroll Fox had opined in December 2012 that the plates amounted to viewpoint discrimination because the state did not also issue plates favoring abortion. 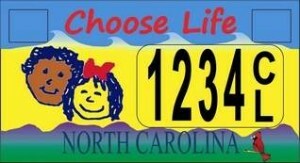 The state first began offering “Choose Life” plates in 2011 after legislators approved a measure allowing the pro-life plates to be produced. Each plate is an extra $25, fifteen of which goes to the Carolina Pregnancy Care Fellowship, a non-profit organization that helps to fund pregnancy care centers throughout North Carolina. According to WGHP-TV in High Point, six separate amendments have been presented to lawmakers in the state legislature in an effort to have produced plates that read either “Trust Women. Respect Choice” or just “Respect Choice.” The legislature struck down all six amendments as they failed to obtain a majority vote. The ACLU of North Carolina then filed suit on behalf of residents who thought it unfair that the legislature would not also allow the issuance of customized pro-abortion plates. But last June, the U.S. Supreme Court overturned the ruling, ordering the Fourth Circuit to reconsider its decision in light of the high court’s ruling earlier this month in Walker v. Texas Division, Sons of Confederate Veterans. The Supreme Court had ruled in Walker that state-issued license plates amount to government speech, and therefore, the state can reject messages that it does not endorse. On Thursday, the Fourth Circuit reversed its previous decision 2-1, advising that the state may be free to issue the plates and reject others. “We now conclude that specialty license plates issued under North Carolina’s program amount to government speech and that North Carolina is therefore free to reject license plate designs that convey messages with which it disagrees,” Chief Judge William Traxler wrote on behalf of the majority.